Can’t stomach the sight of your disorganized drawers? 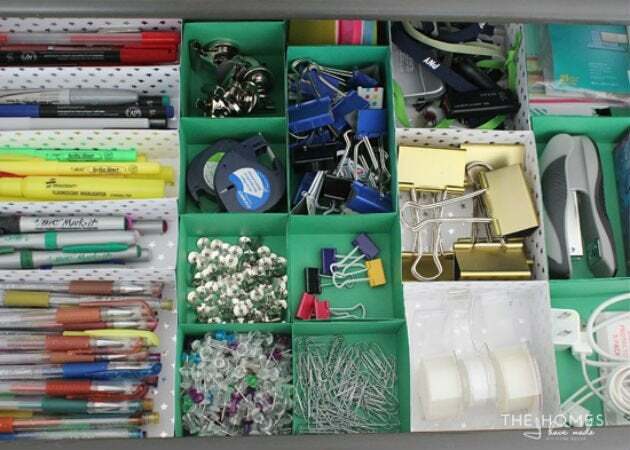 Cure drawer disorder for good with these fast and easy homemade organizers! Drawer dividers are often touted as an easy way to compartmentalize and corral all those loose knickknacks you hide deep in your drawers. But because many store-bought versions are one-size-fits-all—and most drawers are not—you could wind up spending way too much for solutions that only make messy matters worse. Instead of purchasing premade products, look to one of these three easy and inexpensive DIY dividers that will get your junk drawers decluttered for good. Office supplies can be unruly, with pens, pencils, tapes, and trinkets constantly rolling around. Luckily, there’s one hardworking staple that can actually assist in curing your workday woes: Armed with sturdy cardstock paper, as well as some ingenuity and this tutorial, you can craft dividers that are the just-right size for your spaces without costing you a dime. For the tightest-fitting finish, start by measuring the height and width of your drawers, and also of the items you’re organizing. After crunching the numbers, assemble these little helpers by scoring, folding, cutting, and taping according to the instructions provided by Megan from The Homes I Have Made for a colorful result that keeps all your little necessities safe and streamlined. Rifling through kitchen drawers in search of a specific spatula can be a real setback when you’re in the midst of meal prep. 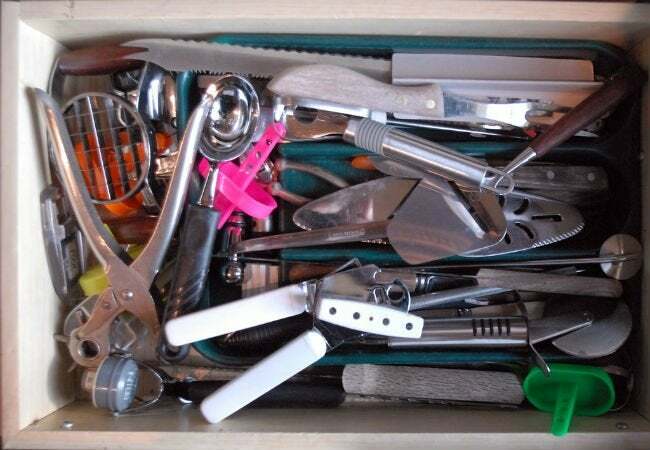 With so many pieces in such a range of shapes and sizes, the utensil pile is a particularly unsavory collection to corral. But this removable remedy can put an end to disheveled drawer madness both inside and outside the cooking zone—all for under $10. 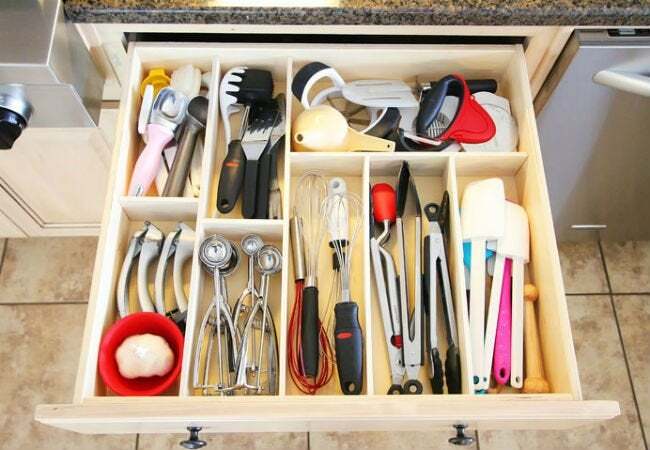 First, figure out how you want to group the items you’re trying to organize, and then use the sizes of the cutlery to determine the dimensions of the compartments. (Kevin and Amanda, the masterminds behind this clever method, used Jenga pieces to outline each section and help them determine where the dividers should go.) Next, construct dividers from 1/4-inch-thick hobby board, cut to size with a skill saw. Finish by using a heavy-duty adhesive to connect the pieces together for a snug-fitting solution that keeps everything in its place. Acrylic drawer dividers are a chic way to streamline cluttered crevices, but they can come with lofty price tags. Get good-looking results without overpaying (or wasting an inch of drawer space) by crafting your own versions from this tutorial by Home Made By Carmona. First, glue dentil molding to the tops and bottoms of the front and back drawers to serve as slots for inserting the dividers. Then, cut an acrylic sheet to form sections that perfectly fit the dimensions of your drawer. For an elegant, dip-dyed look, spray-paint the inserts in your favorite hue. While you’ll need a few tools to make this divider dream come true, the customized and adjustable results are well worth an afternoon’s worth of concentration and elbow grease.